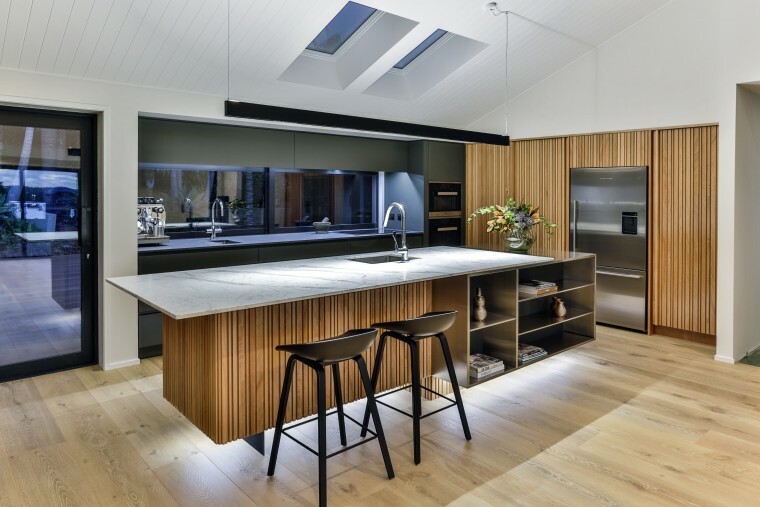 This entertainer’s kitchen by Fyfe Kitchens designer Kira Gray – winner of several industry awards – responds to the practical needs and style preferences of the owners. 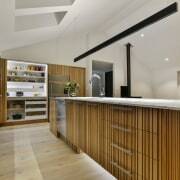 The architectural island with front display shelving is underlit to dramatic effect. A great kitchen with a stunning aesthetic and every practical need addressed doesn’t just fall into place. Using a highly respected designer such as Fyfe Kitchen’s Kira Gray ensures every- thing is considered down to the finest detail, as this contemporary entertainer’s kitchen reflects. A large house renovation gave the owners, a busy working couple, the opportunity to extend their living and kitchen space, says Gray. Another request was that the kitchen link with the outdoor entertaining areas and views. It also had to be enduring, sleek and spacious so the owners, both keen cooks, could share the space. 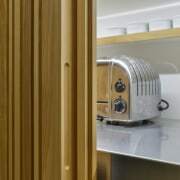 To maximise the living space, the kitchen was set in the corner of the room and, to achieve easy access and create plenty of storage, Gray designed an L-shaped kitchen with an island. Side cabinetry wall in this kitchen features distinctive vertical stave doors, and this warm-look material also wraps around the central island. Doors of random Tawa vertical staves were chosen to clad the wall of cabinetry, and this material is continued on the island. The rich natural surface adds texture, depth and warmth and draws on the requested European influence. The sculptural island draws all elements together. 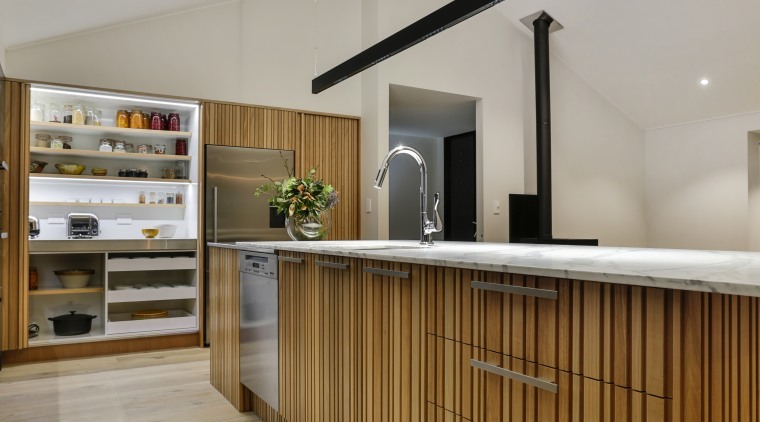 A contemporary, slender cantilevered marble benchtop at one end provides breakfast seating while the stainless steel bar benchtop at the other end has a drinks fridge tucked beneath. A display unit with black-painted interiors on the front of the island faces the living spaces.